We all know and love the benefits of recycled materials. They can frequently be cheaper to buy, ethical, beautiful, unique and somehow absolutely perfect for that exact place. They can really add the panache and character that makes a house feel like a home. This window pictured is one that I picked up at a garage sale recently for $24. I think it’s so pretty! And I’m looking forward to seeing it in all it’s glory in the next tiny house we make. But there are some hidden costs in using recycled / up-cycled / re-purposed / reclaimed materials. Whatever you call them, here are a list of cons you might not have considered. Check over them before you take the plunge. Reclaimed materials can take a lot of time to de-nail, sand, buff, paint, seal, repair etc before they can be re-assembled. 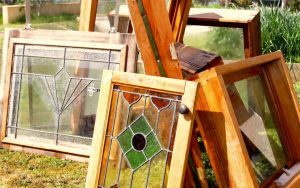 An old window, for example, might not survive being removed from its current casing and being re-framed into one that installs it properly into the house. It will take delicate handling, plenty of skill and consideration. I hope it survives! If you’ve already bought a bunch of things second hand that you’re committed to using, it can start to compromise your design trying to accommodate those item’s dimensions. Say you bought a second hand kitchen sink that’s 700mm long but you realise that you can’t fit everything you need in along that wall because the design is short by 50mm, a new kitchen sink that is 650mm long is starting to look pretty attractive. Once you start collecting materials for your tiny house build, you’ll need a place to store it. Easy if you’ve got a place in mind. Tricky if you don’t. That chest of draws is spectacular. Looks amazing. It’s going in my tiny house! Only… it weighs 80kgs. Not so spectacular after all. If you got it made in pine, cedar or cypress it would be heaps lighter which means you can use the weight for other things, like towing within a safe limit. New items can be made to order, to get that particular window size in that peculiar dimension, for example, and in a light density wood frame to boot. So yes they cost more money, but they come ready to install on the day that you need them in the dimensions and materials that you need them in. Sometimes that’s well worth the money. Find out how to make more effective decisions and avoid unforeseen pitfalls in your tiny house build by attending one of Fred’s weekends of tiny house building workshops for DIYers. Find this helpful? Please comment, like and share it with others. Thanks! Recycled Materials vs New Materials in your DIY Tiny House Build by Shannon Schultz is licensed under a Creative Commons Attribution-NonCommercial 4.0 International License.